'You're not the person I married; you've changed!' 'I'm not the one who changed; you did!' Throughout his career as a marriage counselor, Dr. Steven Craig has heard these accusations repeated by couples time and time again, reflecting a dangerous belief common to many strained relationships: the idea that change should be avoided at all costs. And yet the truth is as striking as it is straightforward: Marriages don't fail when people change; they fail when people don't change. 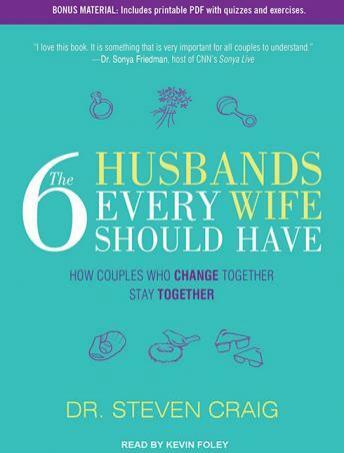 In The Six Husbands Every Wife Should Have, Dr. Craig divides the typical marriage into six stages, outlining the common misconceptions and opportunities for growth at each stage. From the earliest stage-becoming the right person for one's spouse in the new marriage-to thinking and acting as a team and thereafter adjusting to the dynamics of parenthood, caring for older children and elderly parents, adapting to the empty nest, and, finally, growing into the golden years as a dependable companion, The Six Husbands Every Wife Should Have shows how a successful marriage, far from being dependent on finding the right person, actually depends on the husband and wife becoming the right people. Using Dr. Craig's communication tools, checklists, and assessments designed to inspire change, couples will learn who they need to become in order to support each other at every stage of their life together, and they will also learn how to create a road map for getting there. As Dr. Craig says, 'A marriage isn't a marathon; it's a decathlon....Success in a marriage, as in a decathlon, is determined by how well one achieves in each individual event, not simply by getting to the finish line.' With flexibility and awareness as watchwords, The Six Husbands Every Wife Should Have shows couples not only the skills they will need to succeed, but how and when to apply those skills in order to win the race-together.